With the historic warm weather, it appears people have spring fever as well, we have a bunch of new prefab house quotes in the works. Whether they come to fruition, we shall see. But it's nice to have so much interest. In the meantime, I'm answering emails and enjoying the weather. I Am Planning Next Steps For Our Own Prefab House. If you remember, we erected the shell of the prefab house in 2008, so it's almost been ten years since we started this project! THIS HAS BEEN THE LONGEST PREFAB PROJECT EVAH, ha. 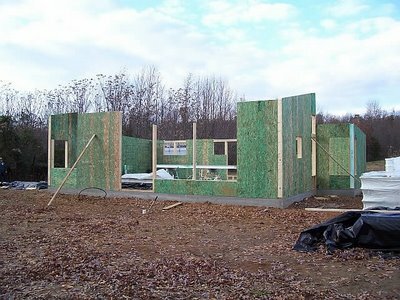 The shell of the prefab house was erected in days. But we were weekenders, and finishing the interior ourselves. Or so we thought: years passed and who, after working a work week, wants to keep killing themselves on the weekends??? It's time to finish the random small projects we still have yet to finish on this prefab house. We found a great local contractor who will take these projects on instead of we. I can't wait. 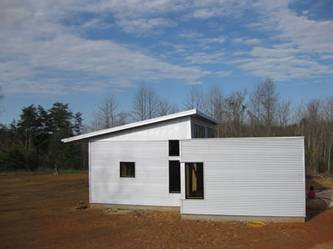 Week 1, we have a prefab house! ...and now, it's almost ten years later. TIME FLIES! Time flies... the Pips grew, too. Consider a storm shelter since every room in the prefab has windows- although SIP are strong and meet code for strong wind, since we have had two tornados in three years I think it's something we should consider. Here's an overview on the coywolves- whereas coyotes are about 30lbs, the coywolves here are 80. "...With larger jaws, more muscle and faster legs, individual coywolves can take down small deer. Coyotes dislike hunting in forests. Wolves prefer it. Interbreeding has produced an animal skilled at catching prey in both open terrain and densely wooded areas, says Dr Kays. And even their cries blend those of their ancestors. The first part of a howl resembles a wolf’s (with a deep pitch), but this then turns into a higher-pitched, coyote-like yipping." Yeah... let's face it, it's never quiet here! The nice weather makes everyone want to play outdoors. After a fall spent obsessing on dirt bikes and potato cannons, it's nice to see Pip 1 getting back on a horse again. In honesty, he is *really* good with equines. I was thrilled to see him riding The Greenie. They are both so much alike it's kind of hilarious to see them ride together. I'm looking forward to see what they look like in a few weeks as their partnership builds and The Green Horse relaxes more when ridden. "CORNBREAD. WHAT are you doing with MY little boy..."
But Pip 2 is keeping her company. I just can't believe with all that expensive tack we have, the Pips just want to ride with baling twine... if even that. Cabbage collards peas and salad are all in. It's going to be another beautiful week at the off grid prefab house. It is unnerving, as it is just not normal to be in the 70s in February. But watchfully, we'll enjoy it. Here's some pictures from February of last year.